Two years after their initial closures, the M1 Oxford and Federation Bridges were officially reopened last week. 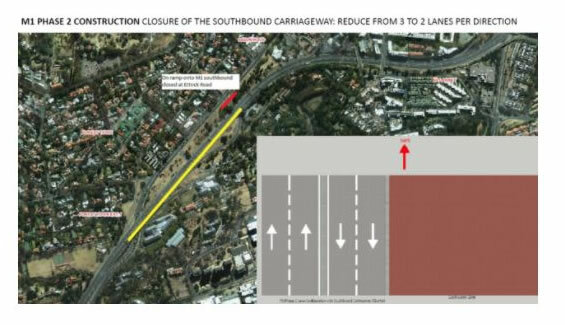 A ribbon-cutting ceremony, held by the Johannesburg Roads Agency (JRA) in Parktown, signaled the reopening as well as the launch of South Africa’s annual Transport Month. The completion of the R140 million structural rehabilitation project, initially scheduled for September 2016, was delayed due to geotechnical complications, according to Mayor, Herman Mashaba. Such complications occur when the soil beneath the road is too weak for rehabilitation. A procedure called ‘jet grouting’ was used to strengthen the new foundations. The three-lane carriageways will be reopened in phases, where the M1 northbound stretch was reopened on Monday, 9th October, while the southbound section had its third lane restored on Monday, 16th October. The Oxford road off-ramp will however remain closed for now. “We are very much aware of the amount of frustration we’ve caused over the last 18 months,” said JRA operations manager Esther Schmidt. “We are aware that we’ve made you late for work. We are aware that your children might have missed their first period of school, and we are aware that you could have even missed an interview. Obviously, it was never our intention and we didn’t do it on purpose, and we do want to thank you for your patience,” Schmidt told reporters at the opening. 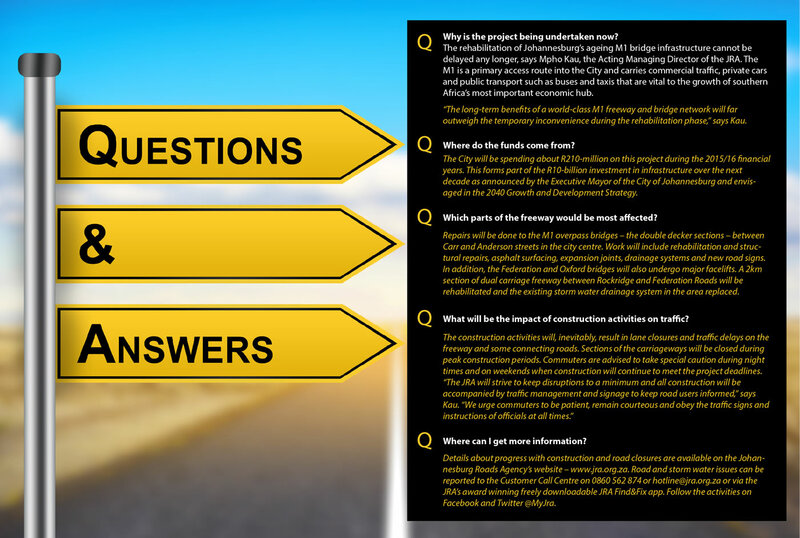 As part of the Transport Month launch, Schmidt explained the JRA’s latest projects, designed to improve driving conditions and the city’s economy. These include a “no joints policy” in which all damaged cables are to be replaced during the rehabilitation period and placement of modems in traffic lights that enable technicians to repair broken traffic lights quickly and efficiently. 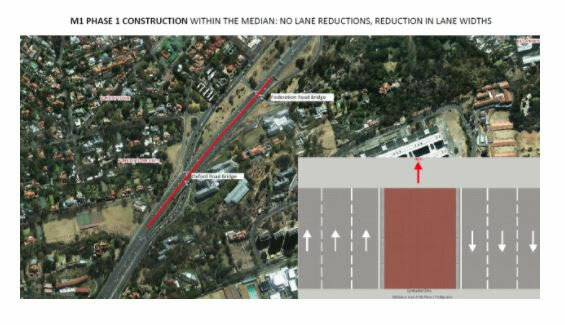 Reduction in lane widths along the M1 between Killarney and St Andrews along both carriageways from 3.7m to 3.4m without any reduction in number of lanes. Three lanes per direction to remain. Work to take place in the median. Closure of the southbound carriageway of the M1 between Killarney and St Andrews with southbound traffic diverted onto the northbound carriageway. 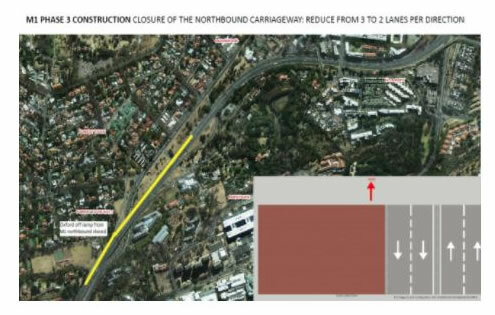 Northbound and southbound carriageways to be reduced to two lanes per direction with a concrete barrier separating the carriageways. Oxford Road on ramp onto the M1 southbound to be closed at Ettrick Road. Closure of the northbound carriageway of the M1 between Killarney and St Andrews with northbound traffic diverted onto the southbound carriageway. Oxford Road off ramp from the M1 travelling northbound to be closed. Between 23:00-03:00 two lanes on either the left or right-hand side of the carriageway (one lane per direction available to traffic). Between 23:00 on a Saturday to 05:00 Sunday and 22:00 on the Sunday to 03:00 on the Monday two lanes on either the left or right-hand side of the carriageway (one lane available to traffic per direction). Safe accommodation of construction vehicle entrance/ exit points as well as safe crossing opportunities for construction workers.